Last Thursday i journeyed to London for a small-scale concert at the Purcell Room. On paper, the concert was being given by the ensemble Radius, but in practice only the pianist was present, supporting a quartet of singers. i’ll admit to being disappointed about that; i’ve not encountered Radius before, so it was frustrating to come away still having not encountered them. 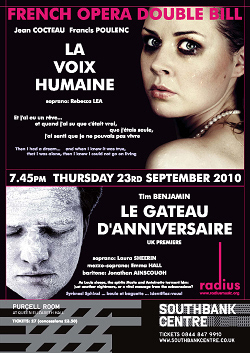 Two pieces were performed: Poulenc’s one-act opera La Voix Humaine preceded by the UK première of a new work by Radius’ director Tim Benjamin titled Le Gâteau d’Anniversaire.